THE Victoria Falls Anti-Poaching Unit (VFAPU) captured three ivory dealers, and more than 300 poachers in 2015, head of operations Charles Brightman says. VFAPU scouts with some of the wire snares they have removed. The ivory dealers, all Victoria Falls residents, were caught in January last year with nearly 10kg of elephant tusks during undercover operations, and each was sentenced to nine years in prison, Mr Brightman said. â€œVFAPU assists and funds a number of these types of operations each year. VFAPU helped in several cases where poachers were arrested for possession of cyanide, weapons and tusks. â€œRecently a pangolin was rescued from two men attempting to sell it, and VFAPU assisted in this success,â€ Mr Brightman said. Of the more than 300 poachers caught by VFAPU last year, 12 were mammal poachers, with the illegal bush meat trade – which results in 3.5 million tons of wildlife being consumed in central and southern Africa each year – an area of great concern, he said. Four warthogs, three impala, two baboons, a zebra, a buffalo and a kudu were found poached within VFAPUâ€™s operational area, a 50km radius of Victoria Falls. â€œIn one incident, VFAPU scouts located a poached buffalo which had been butchered in the Chamabonda area and were then able to track spoor to a house in one of the Victoria Falls suburbs,â€ he said. â€œA trap was set and two men were apprehended with fresh meat from the buffalo. They were recently sentenced to six months in jail. Fortunately, VFAPU scouts were able to save three kudu and a warthog injured in poachersâ€™ snares by darting, treating and releasing them back to the wild, Mr Brightman said. Since VFAPU began operating in 1999, 183 mammals have been saved from a slow, painful death in this manner. In addition, four people were caught selling game meat without correct permits, he said. So far VFAPU has removed more than 22,000 wire snares from its operational area, including 181 last year. Wood poaching remained a major problem in the Victoria Falls area, with 321 wood poachers caught last year, Mr Brightman said. â€œMany people enter state protected areas to collect firewood, and while some is collected for personal use, the majority of wood taken is sold for profit to communities in and around Victoria Falls,â€ he said. â€œA land mine, leftover from the liberation war many years ago, was discovered by one of our patrols within the Zambezi National Park, and the Zimbabwe National Army was called in to dispose of this threat,â€ he said. VFAPU has discovered more than 50 landmines to date. VFAPU scouts also put their tracking skills to use to locate five thieves who were tormenting Victoria Falls town residents. They were charged with housebreaking offences and later sentenced. Three fish poachers, as well as 14 people who illegally entered National Parkâ€™s land, were also apprehended by VFAPU last year. â€œVFAPUâ€™s successes wouldnâ€™t be possible without joining forces with government authorities and working together, as well as public support – every donation, no matter how small helps,â€ Mr Brightman said. â€œI urge everyone to support anti-poaching efforts however they can and wherever they can,â€ he added. VFAPU, founded by Mr Brightman, a local conservationist and safari operator, and hospitality group Africa Albida Tourismâ€™s flagship property Victoria Falls Safari Lodge, fights all forms of poaching, and relies on donations to survive. 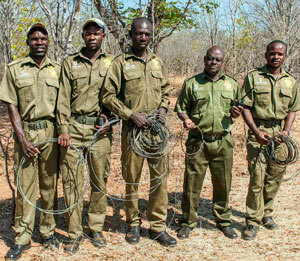 The unit, which employs 17 scouts, works closely with National Parks and Wildlife Management and the Zimbabwe Republic Police to conserve Zimbabweâ€™s valuable wildlife resources. Africa Albida Tourism chief executive Ross Kennedy said the contribution that VFAPU made to Victoria Falls community, tourism industry and surrounding area was immeasurable. â€œNo one should take for granted the dedication and commitment, hard work and passion displayed 365 days a year by Charles and the scouts,â€ Mr Kennedy said. VFAPU needs more, and regular, funding commitments from the Victoria Falls tourism industry, and, indeed, all who care for our wildlife and conservation, as VFAPUâ€™s work and success is a beacon of positive change,â€ he said.